Heat oven to 425°F. 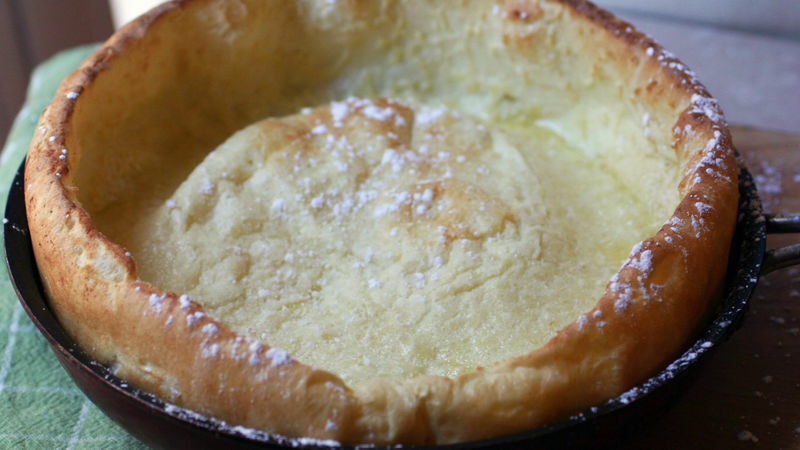 Place butter in 10- to 12-inch ovenproof skillet; place in oven to melt. In small bowl, beat eggs, milk, lemon peel and almond extract with whisk. Add flour; mix until batter is smooth. Pour into hot skillet. Bake 20 minutes or until pancake is puffed and brown. Squeeze juice from quartered lemon over top of pancake; sprinkle with powdered sugar. Serve immediately. If your milk is cold, microwave on High for 30 seconds to warm up. For an easy way to make, place all the ingredients in a blender and blend until smooth.